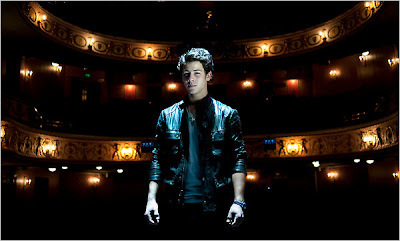 LONDON — As if the 17-year-old heartthrob musician Nick Jonas needed another lesson in unrequited love to play Marius, the romantic lead in “Les Misérables,” 30 shrieking teenage girls delivered one at the Queens Theater stage door on Saturday afternoon as Mr. Jonas, in a black leather jacket and thickly gelled hair, stepped out of an S.U.V. on his way into the theater for a matinee performance. “I want to smell you, Nick!” screamed Holly Roberts, 14, who had traveled here on a 6:45 a.m. train from Liverpool to see Mr. Jonas, one-third of the American boy band the Jonas Brothers. Not to be outdone, Ms. Roberts’s best friend, Amy Shimmin, also 14, yelled, “I want to die in your arms!” — a reference to the scene from the show in which Marius finally answers the affections of the character Éponine after bullets have cut her down. Usually fans mob the stage door after the performance to seek a star’s autograph, as Mr. Jonas proves the enduring potency of casting a young rock sensation in a musical, even one that might be considered old hat after a West End run of nearly 25 years. His star turn, originally scheduled for just three weeks, has been extended through July 24 as he continues to prepare to take center stage at a huge anniversary concert of the show at the 20,000-seat O2 arena here on Oct. 3. For Mr. Jonas, joining “Les Misérables” is not a summertime lark. While growing up in suburban New Jersey, he played the young street urchin Gavroche in the original Broadway production of “Les Misérables” during its final nine months, until May 2003, and at the last performance, the producer Cameron Mackintosh told the young boy that perhaps he would play Marius someday. “At the time I remember thinking that I hoped ‘Les Miz’ would still be around by the time I was old enough for the role, which is kind of funny, because I now realize ‘Les Miz’ will probably play forever,” Mr. Jonas said during an interview after his driver and bodyguard, known as Big Rob, steered him from the fans and into one of the lounges of the Queens Theater. “Les Misérables” was, in fact, the first show that Mr. Jonas ever auditioned for, when he was 7. He was offered the role of Gavroche in an American touring production, but his family declined because his mother was pregnant with his younger brother, Frankie. “Broadway was where I first started finding my voice as an artist and finding my feet as an actor, and the idea of returning to ‘Les Miz’ was about trying to develop more as an actor,” said Mr. Jonas, who is now also appearing with his two older brothers in the Disney Channel series “Jonas,” about three brothers in a pop band trying to live normal lives.